The Corinthian slunk gingerly into the edge of the Beta quadrant solar system under cloak and very keen to avoid detection by anything indigenous to the sector. Two gigantic red suns lay at the centre throbbing gently to one another, pulsing with brilliant orange heat that licked the faces of the ten planets in orbit around them. “The Paggrah system.” Doctor Howard Jones announced from his console at the rear of the bridge. “So what happened to them?” Blake shook his head as he glowered at the planet in the viewer. It was very like earth, much of the surface was covered with water, plenty of land mass for the indigenous population and a well balance Eco-system. “Do they have Warp drive at all?” Ensign Rogers raised an eyebrow, already suspecting she knew the answer. “I would imagine so.” Haldo cringed with a weary sigh. “So they use the same kind of Trans-phasing Warp drive that is fitted to all Starfleet vessels since the Excelsior?” Blake shrugged to his engineer. “Do we go down there?” Katherine asked. “Isn’t there some way we can adapt our equipment to interface with theirs?” Blake shrugged, still hoping to avoid detection. “Haldo!” Blake snapped as he adopted his sternest expression at his engineer. “Their records are just not stored in a medium we can make use of.” Haldo grumbled, his eyes rolling to the ceiling in routine annoyance. “…Which begs the question of why we bothered to come in the first place.” Doctor Jones added with a sigh. “Can you surgically modify us?” Blake raised an eyebrow hopefully. “I’d like to volunteer Doctor Jones to try!” Haldo nudged his arm with a wide smirk. “Go on… you know you want to!” Captain Crowley goaded, waving the small brown box before Captain Graves’s nose. Resistance to temptation was a thing he employed sparingly if at all and the box of cigars was obviously damaging to his health, anti-social and unpleasant. Such things had the highest levels of temptation to a man who had given up on even the idea that what he really wanted might ever fall within his reach, at least on the outside of a holodeck. “I don’t smoke.” He offered weakly as his arm began to move almost involuntarily to the cigars. “If you insist…” Graves smiled as his resistance plummeted altogether to lie in a crumpled heap around him. He scooped up a number of the little brown, finely wrapped alien objects and took them with a proud flourish. Captain Crowley had clearly intended for something else entirely to happen and although a little surprised he said nothing. “So we have a deal?” Commander Morrow asked hopefully. “Lucky us!” Graves scowled and turned away to glower out of the window at the loss of his supply of alcohol. “We’re happy to do a favour for an old friend.” Crowley told them both with a beaming smile. “A friend would have given me a better price.” Captain Graves told him in no uncertain terms. “It wasn’t exactly my idea!” Graves glowered pointedly at his first officer. “It’s you!” Haldo shrugged with a wry grin. “Will it work?” Blake sighed. “Why the hell do I listen to you?” Blake hung his head into his hands. “How many of us can you project down there?” Blake rubbed his face in weary resignation. “If I had a proper crew then you’d be down in Engineering cleaning up the floors with a mop.” Blake smirked. “And you’d be back at Starfleet filling out your Captains exams with no clue about what the hell you were doing!” Haldo reminded him. “Ensign Rogers!” Blake reminded him firmly. “They wouldn’t know which end of a phaser not to sit on, you don’t need a security officer, you need Katherine.” Haldo said firmly. “Now you’re telling me what I need?” Blake smiled weakly. “So when are we meant to meet up with the Corinthian?” Captain Graves asked to nobody in particular although he knew well that only Commander Craddock would be listening to him. The rules aboard the Wanderer were simple, Commander Craddock listened to the Captain, ignored him and issued orders to everyone else. Everyone else was happy with this as before the current arrangement Graves had managed to prove himself a severe danger to himself and others. Graves had an opinion and Craddock knew how to translate it into something that might actually not steer them into the nearest sun so the crew had become accustomed to ignoring everything he said until it came from Winston. “I’ll bet they have a full inventory of booze!” Graves crossed his legs angrily and glowered at the stars as they spiralled past on the viewer. “Don’t I know it…” Graves grunted soberly and with deep regrets that he found himself so. The Paggran home-world was a sombre place, the people slouched apathetically as they slunk around the town’s narrow spiralling walkways. The gloom from the permanently grey sky seemed to have infected the population’s mood making the place a reflection of weariness and routine. Katherine scowled to herself as she watched the people pass her by without pausing to give the interlopers a second look. She relaxed slightly and shook her head in puzzlement. Blake pointed to a window some way ahead, blacked out from behind. “Watch towers?” Blake shrugged as they made their way towards the unimpressive structure. “And the towers?” Blake reminded her as the entrance loomed large before them. “Our soul?” He suggested with a knowing smile. “We wouldn’t care about your job if we were just a sack of chemical signals floating around in organic meat!” She grunted at him disparagingly. “Any fluctuation?” Haldo swung around on his chair, glimpsing briefly at his monitor while the controls flashed the situation up at him and he continued to barely noticed through his boredom. “Nothing I can’t handle.” Doctor Jones grinned at the screen, his eyes fixed and his attention focused like a laser beam at the task at hand. “No fluctuations in you, is there?” Haldo slapped him playfully in the back. Jones frowned but said nothing while he continued monitoring the holographic matrix around the two crewmen. “What exactly are you doing?” Security Chief Goruss Clogg called out. “What do you think?” Haldo turned and shrugged with an expression of amusement. “I’m trying to get a tan from the glow of my instruments, he’s trying to catch a rat that crawled up his shirt sleeve!” He gestured to the Doctor who chose to remain uninvolved. “Why?” Haldo asked, his expression becoming more quizzical and less amused. “A narrow, low energy beam!” Goruss said thoughtfully. “Obviously! 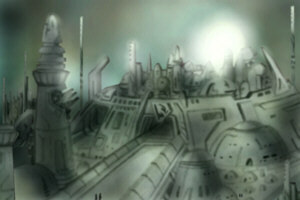 The opposite could vaporise a city.” Haldo smirked. “And you’re monitoring the beam carefully?” Clogg said with a note of relief as he began to relax slightly. “What?” Jones spun around from his console as he and Compz glowered at the officer. “We’re monitoring the beam’s feedback.” Haldo told him as he lunged forward to confirm his scans. Blake breathed out heavily as he stood before the alien; scarcely able to believe that the vast differences between them was invisible to him. “Perhaps it dropped out of warp to make a minor course correction?” Blake suggested, not even sure if the concept of faster than light drive would make any sense to these people. “We’re from far away!” Katherine stepped into the conversation, mindful of the Prime-Directive that instructed them not to intervene in another culture. “Thank you so much.” Katherine beamed happily although her smile would be holographicaly altered before the native would see it. “The Klingons?” Katherine frowned at Blake, suspecting that their charade was faltering. “May I ask why you want this information?” Gravv leant back with a wide shrug and a knowing grin. Goruss Clogg glanced up from his security and tactical control panel while the others hovered nervously around waiting for his report. Blake scowled at the readings. They were simplistic in the extreme and their sensors were able to track them for only a brief time as the alien vessel had quickly gone out of their range. Blake nodded in agreement. “It doesn’t make sense.” He added rhetorically as his mind chewed over the facts. “I thought maybe a few degrees and then back to high warp.” Katherine scratched her head. “Scouting out the whole area?” She frowned. “Which leaves the question of what they were looking for.” Katherine noted with a deep intake of breath. “And how many of them are looking.” Blake turned to look at the Paggran official who had barely been following the conversation. “That was lucky for you.” Blake smiled back, wondering momentarily what the gesture would look like to the alien. “Haldo to Girling!” The signal cut into their conversation through a wail of static. Katherine and Blake stared at each other with surprise for a moment before he answered. “Go ahead.” He told the engineer with an apologetic glance at their host. “We need you up here, we have a problem!” Haldo told him firmly. “What’s happening?” Blake frowned fearfully. “A ship is tracking us, a ship of unknown origin appears to be in orbit with us.” Haldo told them, his voice lowered dramatically. “I understand.” The Paggran nodded. “Do you have any way to contact the Klingons and bring them here in case of an emergency?” Blake asked as his mind tapped back into the Corinthian to begin the process of arranging their transport. The big alien shook his head. 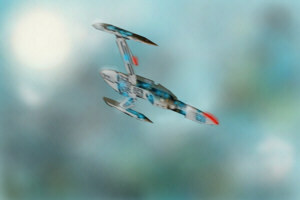 The Starfleet officers vanished in a flickering blur of blue light. “Report!” Blake ordered as he stepped onto his bridge. “It could be Klingons!” Clogg reminded them. “I hope it is the Klingons!” Doctor Jones shuddered. “That has to be the first time in the history of the Universe that someone has hoped that an unknown ship tracking them is a Klingon!” Haldo smiled uneasily. “I’m detecting something!” Clogg looked up from his readout. The Corinthian banked hard as a green blast of energy lashed over her weakened shields. Energy arcs seared over the hull as her defences began to buckle under the attack. Blake glowered at the view-screen as Phaser blasts fired out from the Corinthian into roughly the area where the shot emanated. “Contact…” Clogg grinned from the weapons console as he sent a full spread of photon torpedoes into the cloaked vessel. The first two missed but the third and forth caught the edge of the ships shields and exploded with a ferocious blast of highly focused energy that caused the shields of the enemy ship to phase across her hull. “That doesn’t rule them out!” Blake reminded him as he turned to face Goruss Clogg. “We’ll discuss this later.” He told him with a raised eyebrow. Clogg lowered his eyes to the controls, realising his mistake in firing the weapons without express orders to do so. “We’re leading them away?” Katherine suggested. “Whoever they are they’re still a treat to the Paggrans.” He nodded. Suddenly the ship lurched again as another volley of weapons fire caught her port nacelle. “Analysis?” Blake turned to his engineer as the Corinthian automatically began evasive procedures. “So it is the Klingons?” Clogg nodded knowingly. Seven brilliant white balls of energy streaked from the nose of the ship in rapid succession and travelled around in a wide arc to track back to the object behind them that was still cloaked. They blasted into the vessel, the first three missing entirely while the forth caught the outer edge of the shields. As they were programmed to do they all began tracking the explosion and detonating as close to it as they could. “Direct hit!” Clogg grinned as he announced triumphantly. “Like us?” Katherine raised her eyebrow quizzically. “A little too like us!” Blake agreed as they watched the reverse angle on the large holographic viewer while the approaching vessel swam closer towards them. The vessel had a large central hull and two straight wings jutting out with a nacelle at each of the tips. The viewer lit up with a green arc of energy as their main weapon lashed out from the nose. The beam caught them on the tail as the Corinthian continued on her evasive manoeuvres. A power conduit erupted at the rear of the bridge sending a cascading blaze of sparks and smoke from the damage. “Why the hell do you keep putting that much power into the bridge control systems?” Haldo shouted at Doctor Jones who had designed much of the ship. “That certainly didn’t feel like a Romulan Disruptor!” Blake noted. “Shields are down to 80%, Impulse engines are stuttering, we’re losing power.” Clogg warned. “Program set.” Haldo told the Captain. “I’m ready.” Clogg added in agreement. The Corinthian suddenly streaked through space as the warp-field began to establish itself and then the vessel erupted in a silvery blast as it tore away through subspace. The Romulan looking vessel followed them to unwarily warp and flew straight into the inert torpedoes which instantly exploded around her causing damage to the vessels shields. The Corinthian emerged from the warp trip and automatically began retracting her nacelles to protect them from damage from incoming Disruptor fire. They turned to target their entry point and set the phaser cannon to its highest setting to blast the ship as it followed them out of warp. “Yes sir!” Clogg replied more than happily as his fingers hovered expectantly over the controls. Suddenly the vessel streaked out of subspace in a blaze of energy. The phaser beam caught it almost instantly and it erupted in a blaze of red energy, vanishing completely behind the explosion. “Yes!” Clogg slammed his balled fist down hard on the console in triumph. “That was a photon torpedo blast!” Haldo told them with a very worried expression. “Scan the area!” Blake ordered, jumping up from his chair. Suddenly the Corinthian rocked to the side as another Disruptor blast caught them. Phaser beams stuttered out from the ship, reaching into space towards where the shot had come from. A beam caught the cloaking device of the vessel and it stuttered towards failure as the shields came back to full power. “Our ventral shields are down to 25% and falling.” Clogg warned. “We still have weapons.” Blake sneered as a blast from the cannon reached out to the attacking vessel. “Hail them!” Blake turned to Katherine. “They prefer the universal language of kicking our arse!” Haldo frowned at the ship loomed large in the viewer. “I speak it like a native.” Clogg replied with a testosterone filled expression of maniacal anger. “They’re heading off and building to warp!” Katherine told them. Both vessels vanished in a blast. “It can’t hold this speed for long.” Doctor Jones shrugged as he watched the tail section of the Romulan vessel before them. “Nor can we.” Blake rubbed his chin. “But this one is a radical design, way outside of normal Federation engineering practice and the Romulans are behind us in weapons and propulsion fields so how did they make the jump?” Blake asked rhetorically. “In your case for many life times!” Haldo added. “Not really.” He shook his head. “It’s close but refitted perhaps.” They all looked at the engineering schematics of the Vernak class vessel as they appeared in the Section 31 vessel archive. It was a light cruiser, designed for high warp transport and routine science missions while having limited weapons. “It looks very close!” Blake said curiously as he compared it to the scans. “Could they have built a whole new vessel that was so closely inspired by the Vernak?” Blake shrugged. “And you came up with this?” Haldo sniggered. “Maybe that is how they came up with this?” Blake frowned. “What do you mean?” Jones glared as if the suggestion was a personal sleight. “Is there any way that the Romulans could have got hold of Borg technology from the recovered scout?” Blake asked. “How do you know?” Haldo raised an eyebrow, enjoying the awkwardness that the line of questioning had caused his reluctant colleague. “What about the Scarab?” Clogg suggested. The Romulan ship banked as it dropped to sub-light speed and rounded away from the trailing Corinthian while firing a spread of energy bolts from it’s rear weapons pod. The Corinthian spiralled through the incoming energy only getting caught by the last as it skipped over the starboard nacelle causing little damage. She responded with a blast from the nose cannon which caught the central hull and staggered off the powerful shields. “Where is she heading?” Blake frowned as the ship sped away from them. “Which means they have a plan?” Haldo suggested. “They’re acting out of character if they don’t.” Blake nodded in agreement. “They’re luring us in!” Clogg warned them. “I still have torpedoes and a good weapons lock.” Clogg sneered at the Romulan ship in the viewer as it slowed down to get a better look at the Corinthian who had suddenly begun behaving oddly. “We have her interest.” Haldo noted as the Romulan ship turned to face them, drawing to a full stop and reaching out with her advanced scanners. “What’s her shield status?” Blake turned to the viewer and glowered at the enemy ship. “Can’t this ship scan with enough efficiency to predict a ship’s motion from the particle wake?” Clogg shrugged. “What about if we blow up a rock so that they’re suddenly the only stationary thing, wouldn’t the blast show up any cloaked ships?” He suggested with a grin. “It would…” Haldo grinned back at Blake. “Make it so!” The Captain nodded. “Torpedo away.” Clogg told them. The cloaking shields were extended around the torpedo as it streaked invisibly from the nose of the Corinthian until it had travelled too far to hide but that was long enough not to betray the vessels position to the Romulans. It streaked on past the startled ship as it fired its thrusters to manoeuvre away, assuming that the weapon was aimed at her. It found a large rock in the heart of the asteroids and exploded with a high yield of anti-matter, vaporising the first rock and sending a shock-wave through the field. “Sensor data coming in!” Doctor Jones told them happily as the figures scrolled by on his terminal. “Rather them than us.” Haldo shrugged. “Hail them.” Blake commanded, stepping closer to the viewer. “They’re still refusing to answer.” Katherine shook her head sadly. “They want us to track them.” Blake sneered as the lead vessel slowly turned and headed away. “Doesn’t mean we have to!” Doctor Jones interjected nervously. “So we have no choice now but to follow them.” Haldo shook his head in disgust at their tactics. The Corinthian emerged from her Warp travel in silence, unseen behind her cloaking device and entered orbit around the defenceless planet. “What class?” Blake sighed wearily. “We have to find this Romulan ship!” Blake rubbed his head thoughtfully. “Safe to assume it has!” Blake agreed. “If they enter the atmosphere we could track them, even if cloaked.” Katherine suggested. “Only if they enter the atmosphere this side of the planet.” Blake’s eyebrows arced down angrily. “So what do we do?” Haldo shrugged. “Clogg seems eternally ready to shoot at things but I can’t give him anything to shoot at.” Haldo sighed. “So what do we do?” Jones asked, suspecting he was not going to like the answer. With a glimmer of light the Corinthian swam lazily back into view as the cloaking device melted away. As it did the shields came instantly up to full power and the main phaser banks charged in readiness. The ship rocked slightly as the Disruptor beam lashed her shields. As they arced with energy two Romulan scouts uncloaked and began an attack run. 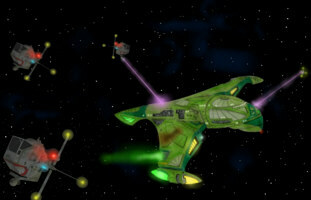 Green over their hull’s surface they bore the unmistakable modular form of the scout class vessel with additional weapon mounts beneath the wings. 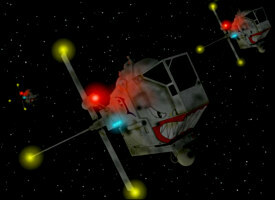 The white lights of the weapons streaked across the viewer and caught each of the two vessels as they made their run. The blast was sufficient to send both spiralling out of control away from their intended target and incapacitate them momentarily. “Done.” Clogg replied happily as the orange energy lashed across the viewer and tore into the little ships. “Lock the cannon onto it and open hailing frequencies.” Blake stood up excitedly; hoping that a way to prevent further bloodshed had finally presented itself. “Open!” Katherine said in surprise as the ship responded. “I doubt they will…” Haldo muttered pessimistically. “Their shields are down.” Clogg said in surprise as the scout swam into view before them. “Course laid in.” Katherine told him with a heavy breath as confirmation arrived on her terminal. The ship engaged on its path instantly towards the crippled vessel, closing fast. Suddenly the Romulan craft exploded violently as the core breached. A viscous blast ripped into the Corinthian sending her sprawling through space out of control, her shields being pummelled from the force and her hull taking damage. A shower of sparks arced around the control bridge as thick, acrid tendrils of smoke curled from the burnt-out circuitry of the damaged vessel. “Status?” Blake cried out above the emergency measures that were struggling to reassert themselves. “And we still have that ship out there to contend with.” Blake groaned. Suddenly the Romulan ship floated into view ahead of them, her Disruptors fully charged and ready, her launch tubes loaded. “Paggrans!” Blake sighed as he switched the viewer to the incoming vessels. They were small, aggressive ships with an oddly arranged ion engine running at the centre of the tail and the cockpit bolted precariously on the front. “I know.” He cut her off. “They don’t know what they’re up against. They don’t have a hope.” She persisted. A flash cascaded from the weapons binnacle in her nose as a full spread of five torpedoes blasted from the Corinthian. They ripped towards the Romulan ship who had already detected the firing cycle and began to move away in readiness, strengthening her shields where they were needed most to limit the effect. Two of them tore into the shields causing little damage as the Corinthian prepared for another attack as it dragged every last ounce of power from her weakened impulse engines. 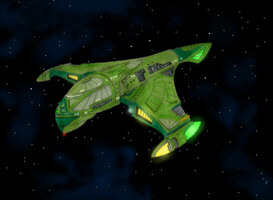 Suddenly the Romulan vessel lit up as flash after flash exploded onto her unprotected flank. The Paggrans continued their assault without any respite while the photon torpedoes from the Corinthian lashed one after another into her weakening shields. “I have power to the cannon.” Haldo announced proudly. “That won’t be necessary.” Blake told him firmly, a little surprised at their abilities. “If they won’t tell you I can make them pretty.” The leader of the fighters scowled at the crippled Romulan vessel. “Please stand by.” Blake nodded and turned to his crew as the image flashed off. “Another moral victory for the Prime Directive!” Clogg added. The middle viewer flashed to the bridge of the smashed vessel with several Romulan officers dashing about trying to maintain life support. “Name your terms.” The Romulan Commander cried out over the noise aboard his ship. “I want information first.” Blake told his sternly. “Why did you attack us? “What have we done?” Blake frowned at his adversary. Suddenly a Tractor beam lashed out at them, locking the two vessels together. “Can we get away?” Blake called out as the viewer switched to an external image of the Romulan ship. “Not with our power losses.” Haldo shook his head. Katherine nodded and sent the message the little fighters who duly complied, only moving far enough to get out of the blast range so they could remain and watch the explosion. “Will our shields hold?” Blake asked grimly, already knowing the answer. “Not a chance.” Haldo racked his brain for a solution. “Where is the beam focused?” Doctor Jones suddenly jumped up with a wide smile. “Our tail, just behind the main impulse reactors.” Haldo shook his head. Blake looked at the expectant faces around him and instantly vanished in a flickering blue glimmer of light as he guided the transporter beam with his mind. He materialised aboard the replicated shuttle as the ship ejected it into space inside the shields of the vessel. He quickly set the co-ordinates and launched the powerful shuttlecraft towards the target, dematerialising the instant he did so, hoping that the transporter cycle would be fast enough to return him to the bridge. The shuttle exploded into the exposed metal, shearing through the struts and girders that were already weakened by the battle with the Romulans Tractor-Beam. The blast blew the Corinthian forwards and she fired her thrusters to move away as quickly as she could from the Romulan. She engaged her warp drive just as the enemy vessels warp core exploded. Blake appeared on the bridge in a flashing blue light. He spun around quickly, waiting for a report, slightly surprised to find himself still alive and in one piece. Blake sighed wearily and collapsed into the command chair. “Impulse?” He muttered. It took three days buried at the heart of a volcano on Paggrah to regenerate from the damage but the geo-thermal heat disguised the ship from the investigating Klingons who seemed to be in something of a hurry to get away from the Paggran home-world for reasons of their own. Ten seconds after they launched under the veil of secrecy afforded by their cloak they were back at the heart of the Alpha quadrant to rendezvous with the Wanderer emerging with a blast from a Transwarp tunnel. “Transwarp signature.” Commander Morrow huffed indignantly, bored with the long wait. The image of Captain Blake Girling appeared on the viewer. “Hello gentlemen.” He smiled with a careworn expression. “We ran into some trouble.” Blake explained. “Maybe you should beam over for a briefing?” Blake told him, ignoring his winging. “I’ll arrange to do so.” Graves began as he was suddenly enveloped by a transporter beam and instantly appeared in the briefing room at the rear of the Corinthians bridge next to his first officer. “Then that’s what we do.” Blake told him firmly. “And us?” Commander Morrow squinted suspiciously.